Good Saturday afternoon readers and sorry for the tardiness with regards to finally getting around to part 3. Work has been very busy and not much computer or radio time! 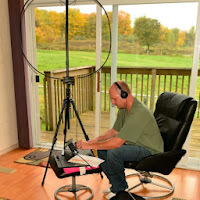 In this part I am going to look at the antennas I have used and I have used a lot of different configurations. I had some responses from those who live in condo townhouses I too have lived in a condo townhouse and had great success. Most townhouses up this way are of wood construction which is good news for the indoor antennas. If you have a multilevel townhouse you most likely have access to an attic. There may also be a back deck and or a small to medium backyard. Let me begin by saying this segment on antennas assumes you are looking for something that is either hidden or looks like something it's not. Most (but not mine) town homes have a garage and driveway to-which you park a car in. I have found a very simple way to get on the air is to put an antenna on your car and run coax out to it. Now having said that you don't want to run around town with a huge antenna on your car (maybe you ...but not me) There are many fast connect/disconnect mounts on the market. As for the antenna I have seen and did have a multi-band HF antenna. I did operate my home HF radio with a multi-band antenna.....yes I did say I had no driveway or garage but more on that in a minute. The antenna I used was something similar to the Comet UHV-6 mounted on my car. There is also the Hustler triband adapter to allow 3 Hustler resonators to be used at the same time. With these types of antennas or similar ones you can run coax out to your car in the driveway connect to the antenna and your on the air. In my case my townhouse at the time did not have a driveway or garage it was a common car parking lot. So what I did was I buried LMR 400 in plastic tubing out to where my car was. I terminated the coax to an SO-239 in a small plastic box. The box was in a small bush and unseen. When I wanted to go on the air I connected a small jumper of coax from the box to my car antenna. I was able to use this for about 3 years. If you have an attic and I did in one of my town homes the best antenna for me was the Alpha Delta DX-EE. I mounted this antenna in my attic is a "Z" configuration. To mount it I used stand off's for electric fences. This antenna was very close to the roof and other wood 2x4 rafters but surprisingly I had no real issues with SWR. My Elecraft K3 radio has a great tuner in it when needed. antennas of this kind in the attic. One antenna I had and tried in the attic but could not get it to work was the High Sierra sidekick antenna. I tried various ground radial configurations but could not get it to tune at all. I did end up mounting the High Sierra sidekick antenna in the backyard close to our deck. It was in a very hard spot to see and I was able to remove the antenna when not in use and bring it in the house. I was able to conspicuously bury some radials and was able to get a decent SWR. Because our condo town home was mainly wood construction I was also able to setup my Alex Loop in the living room by the patio sliding glass door and make some decent contacts. Another failed antenna for me was the Hy-gain tape dipole and I am not sure why it did work and the DX-EE did but it was worth a try. I had this antenna for some time so there was no money outlay but it just did not want to tune. Part 4 will be dealing with Ham radio in a condo apartment building and how I have successfully gotten on the air for the past 6 years. Mike Weir, VE3WDM, is a regular contributor to AmateurRadio.com and writes from Ontario, Canada. Contact him at [email protected]. This brings back memories of when I strung a (short) long-wire in the attic of our condo when i was a teenager. I used a tuner to work most bands and it was remarkably good. At least it got me on the air! Back in the days after I got to be old enough to have a CB license, I rigged a huge squareish wire loop along the ceiling line of my basement bedroom and tuned it to resonance on channel 21. Its efficiency was quite poor, largely because of horizontal polarization and little elevation above average terrain, but almost everyone in the part of town that used that frequency could hear me on a base station when skip wasn’t running. If a 17 or 18 year old kid with little formal training or professional experience in radio electronics could do this in the early 70’s, why in the world would a amatuer radio operator have any trouble, aside from his/her desire to be an appliance operator in an experimental paradigm? I see that big expanse of green complete with a tree in the background. What a shame it has to go to waste! What happened that forced Ham Radio into a bizarre world where we are prevented from putting up even a simple piece wire? Where was the ARRL when this was happening? When I was a kid my first dipole (40m) went up and crossed a corner of the neighbor’s property. The neighbor helped me put it up! Today my mother still lives in that house. Putting up a simple antenna on her property today would bring the wrath of God down on her along with hefty fines and worse if she doesn’t take the wire down. What a disservice to the country. Thanks for a great article including photos Mike! This has given me some more ideas to experiment with. I am looking forward to Part 4 of this topic. Good afternoon Lindsey, thanks so much for taking the time to read and submit a comment. When I first was starting out I had the Kenwoood TS520SE along with the R7 vertical antenna. Ahhhh those were the days, I then moved onto an Icom 745 to an Icom 735. Never yet to date have had a tower BUT never say never! Thanks again for the comment Lindsey and have a great weekend and week. Greetings David, very nice to hear from you and I too was amazed with how the Alpha Delta DX-EE preformed in the attic. I had made QRPp contacts into Europe with as little as 100mw of power. That antenna (along with decent propagation) netted me many contacts. 73 David and thanks for stopping by. Hello Bill and very good point for usre! I too started out as a CBer and had some very funky antennas that surprisingly worked very well. My first CB was a six channel Johnson messenger and then I moved up to a 69 channel Cobra. Thanks for the comment Bill and have a nice week. Good afternoon David and yes that is a huge green space! But in my case that green space it a right of way for 500KV hydro lines there are 3 sets of towers running north/south. I was very please that I had no issue with rf interference with them. It sure would had been an amazing long wire if I had the “ok” to run a long wire to the trees in the background. 73 David and thanks for the comment.